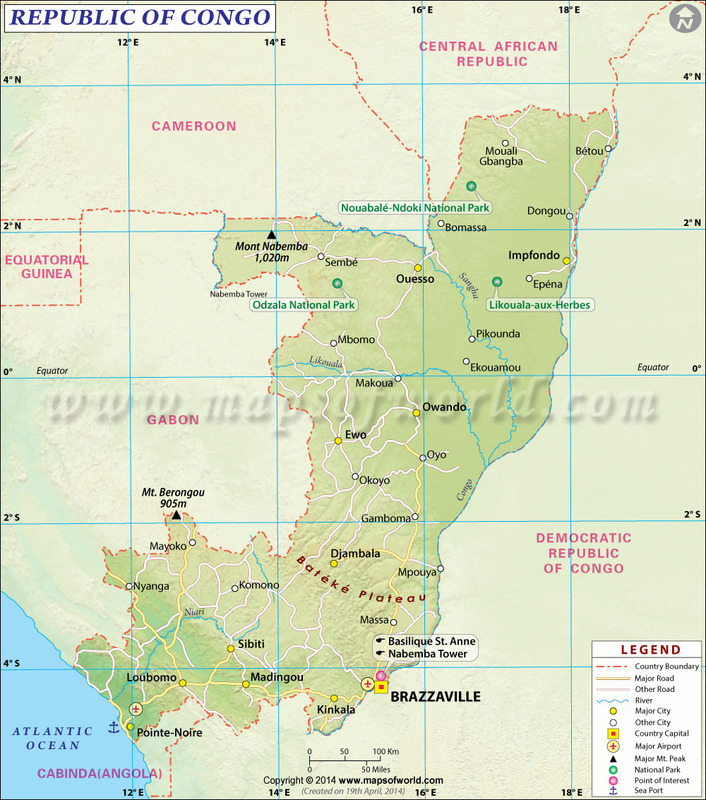 The map of Republic-of-Congo offers detailed information on the accurate geographical position of the country. The Republic of Congo encompasses total area of 342,000 sq km. The early people of the Republic of the Congo were a Pygmy tribe known as Bambuti, who lived in the region pre-1500 BCE. The Bantu people known as the Bakongo (or Kongo) migrated to the area from the north, establishing kingdoms beginning about 2,000 years ago. The arrival of the Portuguese in the Congo around 1484 brought huge changes, including the development of the land and trade relations, including part of the transatlantic slave trade. In the Scramble for Africa, French colonists settled in the Congo in 1880, becoming the Congo Colony, later to become French Congo and then Middle Congo as the French African territories expanded over the next few decades. These colonies, which included the Congo and present-day Central African Republic, Chad, and Gabon, were united to form French Equatorial Africa, headquartered in Brazzaville. During French rule, the territory served as France's capital when the Nazis took over France in World War II. In the 1950s, the French colony divided into regions that remained part of the French Community, until the Republic of the Congo emerged as a separate entity in 1958 with recognized independence in 1960. Since independence, the Republic of the Congo has experienced a period of socialism, and relations with communist nations, leading to the establishment of the People's Republic of the Congo in 1969. The next decades saw political unrest, including the assassination of President Ngouabi in 1977, and with the dissolution of the Soviet Union, the Congo began to move towards democracy. The country held a multiparty election for the president and members of parliament in 1992. The democratization of Congo was not without its own turbulence and unrest, government overturn and civil revolts at their worst around the 1997 elections. In 2002, Denis Sassou Nguesso was reelected to the presidency, though the election was highly controversial and plagued with suspicion of voter fraud, considering the president won 90% of the vote. Sassou was reelected again in 2009 under similar circumstances, as the country continues the struggle toward democracy. The Republic of the Congo shares borders with Gabon, Cameroon, Central African Republic, Democratic Republic of the Congo, and Cabinda, Angola. Located on the Equator in sub-Saharan Africa, the Republic of the Congo has a hot and humid tropical climate year-round. The terrain of the Republic of the Congo features rainforests, a central plateau, river basins, and coastal plains along the Atlantic coastline. The rainforests of the Congo cover 70% of the land, and are habitats for many species of wildlife, including a population of gorillas. The major mountains of the Congo are the Mayumbe mountains, which include the country's highest point at Mont Nabeba, which stands 1,020 meters (3,346 feet) above sea level. The main rivers include the Congo River and the Kouilou-Niari River. Natural sites in the Republic of the Congo are some of its best attractions, offering safaris and outdoor adventures. Odzala National Park is a good spot to view the country's wildlife, including its gorillas, monkeys, and elephants. Ndoki National Park, Douli National Park, and Louana National Park each offer a variety of wildlife, including marine animals and land animals, as well as camping and hiking opportunities for visitors. The Congo River is another important natural site in the Congo, offering river adventures and more. The capital in Brazzaville features colonial architecture including beautiful churches and palaces. Additionally, there are plenty of dining options and vibrant markets. The city of Owando is another good destination for its market. Along the coast, Pointe Noir offers French colonial architecture and cultural influences, beaches, and the amazing Diosso Gorge nearby. The main airport in the Republic of the Congo is Brazzaville's Maya-Maya Airport, which primarily offers service to several African countries. Another big airport is the one in Pointe Noire, which does offer domestic service to Brazzaville. There are some paved roads in the Republic of the Congo that are fairly safe to drive, but other roads can be dangerous, particularly in poor weather conditions. Train service is available through the rainforests of the Congo from Brazzaville, called the Epic Jungle Train, offering an adventurous ride through the scenic lands. Boat is another option to navigate the Congo River while enjoying the views and wildlife along the way. In towns, visitors can hire a car or a taxi to get around. The flag of Congo Brazzaville was officially adopted on August 18, 1958 The People’s Republic of Congo used a red flag with the ensign of the People's Republic. The current flag was readopted on June 10, 1991.